Katie’s got it pretty good. She’s a talented young chef, she runs a successful restaurant, and she has big plans to open an even better one. 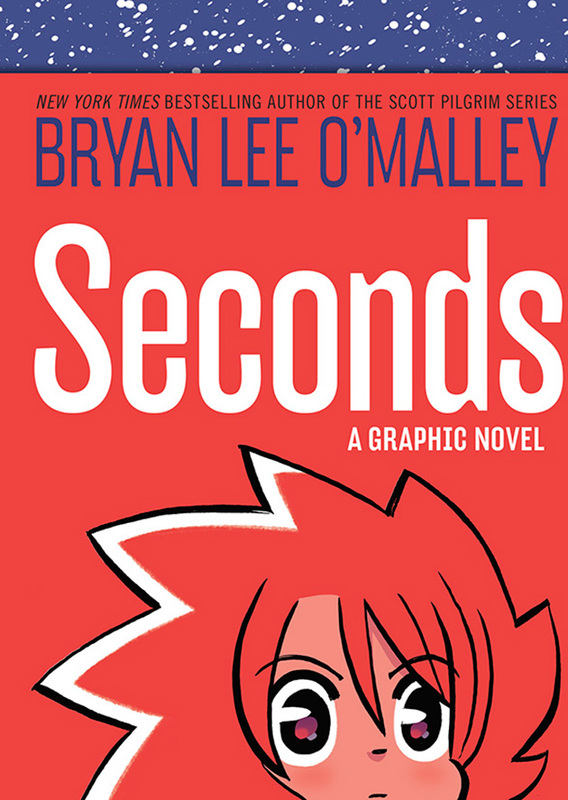 SECONDS by Bryan Lee O’Malley is probably one of the most original graphic novels I’ve ever read, at least in terms of plot. 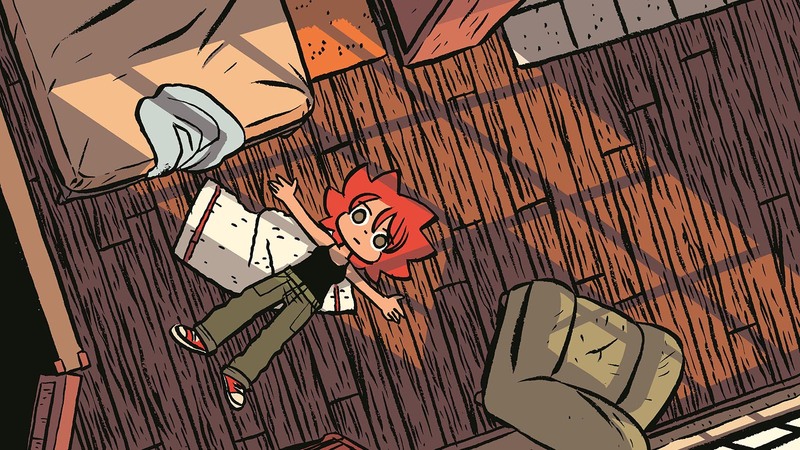 This isn’t exactly surprising, given that O’Malley is the creative powerhouse behind the much-loved Scott Pilgrim series. But unfortunately, the creativity of this story wasn’t enough to make up for a supremely frustrating protagonist. At 29, Katie is transitioning from her position as executive chef at the popular restaurant Seconds into her new role as restaurant owner. Rather than buying out Seconds, she has decided to forge ahead and open a new restaurant, a project that is entirely hers. But things are not going as planned and Katie is getting desperate. 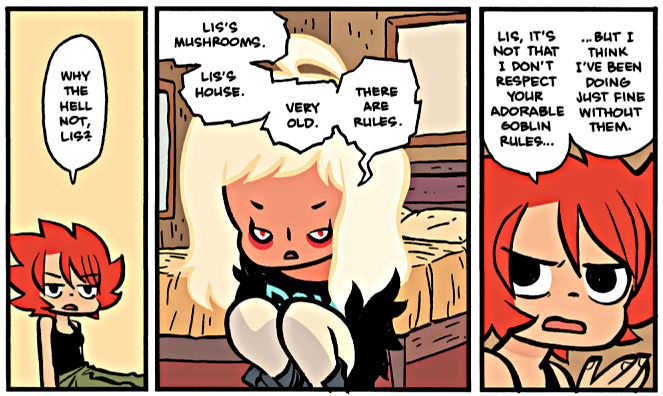 Enter the house spirit of Seconds, a little elven creature named Lis who promises Katie a redo. She gets one second chance to get things right, to be happier. Because lying prone on the floor angsting about your life everyday? Not a great way to live. O’Malley writes SECONDS in what I’d call a ‘fantasy lite’ style: he includes fantastical elements that are necessary to drive the plot forward but do little to flesh out the world. Aside from Lis and her vague sort of magic, there is very little that sets Katie’s world apart from our own. This isn’t a criticism per se, since I don’t think that SECONDS would have benefitted from more world building. At its core the story is a character study, an examination of Katie and her choices. Maybe that’s why I had a hard time getting into this one, since the biggest issue that I had with SECONDS was Katie herself. She is unbearably self-absorbed to the exclusion of all else; it’s not uncommon for her to be completely unaware that she has offended someone or hurt their feelings, failing even to notice that her friends are out of sorts. But then again, calling them her friends isn’t entirely accurate. Katie doesn’t really have friends, she has employees – and that’s precisely the problem. The only reason that Katie begins to see her employees as people who have value outside their contribution to Seconds is because she needs them to help her make things right again. Katie may be a brilliant chef, but she’s kind of an idiot when it comes to real life. I mean, who would have thought that breaking Lis’s “one second chance” rule would have dire consequences? Honestly. It’s like Katie’s never read a book in her life. While it starts out as a fairly light-hearted examination of the trials and tribulations of making “real world” adult decisions, SECONDS is actually a surprisingly dark tale. The story takes a grim turn towards the conclusion, as Katie must finally deal with the consequences of…well, never having to deal with consequences. The final confrontation in SECONDS isn’t between Katie and some great villain, but between Katie and herself. She combats her selfishness and her perfectionism, leading to a satisfying if overly tidy conclusion. Have you read SECONDS or the SCOTT PILGRIM series? What do you think of O’Malley’s art style? Do you prefer character studies or plot driven books? Inquiring minds want to know! I’m a big Scott Pilgrim fan too, gotta support those Canadian authors! 🙂 Yeah I know what you mean, Toronto has a really great vibe to it that I think some writers can capture very well…and others not so much. I also really like O’Malley’s art style. I don’t really read a lot of graphic novels and that’s something I should really amend. Pity you didn’t enjoy this one more. If you have an absolute, must read, example then let me know. OH BOY, do I ever! You would absolutely LOVE Rat Queens (the first two volumes are out), which is a high fantasy series featuring five heavy drinking, brawling, cussing ladies. Saga is also a must read, a classic space opera with romance and humour to boot! I almost requested this at some point. Was quite curious but had seen a couple of less than stellar reviews, and then noticed I could just get it from my library, and then never got around to reading it. Sorry you didn’t enjoy this one more. The final confrontation with herself actually sounds like it could be interesting.